I have been jazzin' up my staircase for a few weeks now and have procrastinated a bit on the final touches. I can say that for now, I have decided to hold of on the moulding boxes that were going to go under the chair rail. I am really enjoying how the two toned wall comes off as being more modern rather than traditional, at least to me, so I think for now I will leave it as is. The other factor that led me to this decision was the thought of many framed boxes going up the wall after I hung the Ikea Ribba frames that I had bought. Oh right, I also decided against a full on gallery wall, lots of indecision over here which is why I have been working on this wall for so long but alas, plans have been made! The wall is not done yet because I am always a chicken at starting a project that could potentially ruin a wall and involve more work to fix it. Once I start these projects they are never as scary as I make them out to be in my head, I know a lot of you know what I mean here. Back to my little Ikea frame upgrade. Of course I was in Ikea a few weekends ago picking up the 19x19 silver ribba frames to go up the stairs. 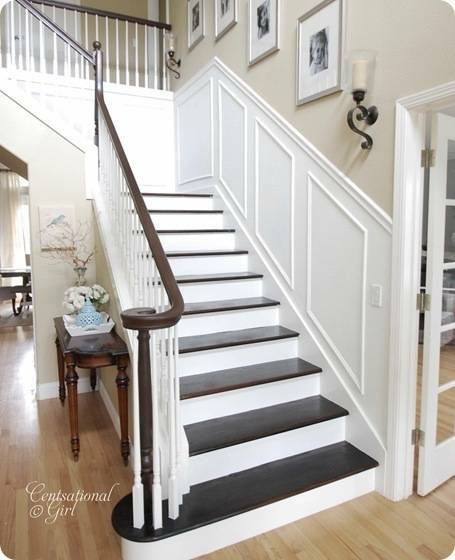 While visiting Centsational Girl's blog, I came across her finished staircase (AMAZING by the way), you can see it here. I loved how open the big silver frames made the space feel and I knew immediately this is what I wanted rather than a lot of pictures packed together. Although I love this look as well I just knew it would seem too cluttered for my stairs. What I had done before knowing this was buy five separate mats that have slightly smaller openings for the pictures and had the ultra white mat I needed. Needless to say I spent a little extra cash for the mats but now that I put them side by side with the standard ribba mat, I find myself torn. This is where you guys come in, so check this out. So, what do you think? Smaller mat that was an extra $12 or stick with the mat that came with our dear ribba? Almost there everyone, happy Thursday! I love the extra wide mat. I am in the middle of putting together a wall gallery. I love your wall of photos going up your stairs. By the way...I just pinned your photo as more inspiration for my wall gallery. I like them both! I'm a cheapo so I'd probably not spend the extra $. Can't wait to see it when it's all done! Hi. :) May I ask where you got your wider mats from? Or were they custom made? I just purchased some of these RIBBA frames myself with the intent to buy some wider mats. I love the more contemporary look of a wide mat but I am not sure where to look.